Forgot to Record my Odometer! 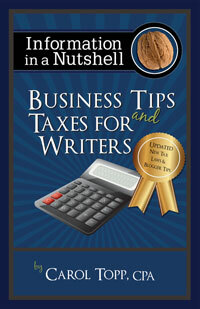 I’ve also done a book on tax tips for writers. Good luck with your book. I appreciate the well wishes from such a well known and respected author and tax expert. My publisher asked me to contribute this book to their Information in a Nutshell series and it includes several chapters on business aspects of being a writer such as choosing a business structure, software for record keeping, dealing with inventory, etc as well as information on taxes. I’ll have my publicist send you a review copy if you wish.